Here's a little video that shows you behind the scenes as I write at the London Library and here's the reasons why I love it! In the last month I have been working at the London Library a couple of days a week and it has made all the difference to my new life as an author-entrepreneur. Founded in 1841, it has been the writing home of many great English creatives. Here's why I love writing there these days. I read 99% ebooks these days. I am a Kindle addict although I often buy the ebook after seeing it in print in a physical bookstore. Being in a print library has meant I am rediscovering the joys of book browsing and the labyrinthine stacks of the London Library are quite the adventure. I had a lovely moment of serendipity the other day when researching apocalyptic art for my next novel Prophecy and came across the book from an exhibition of the apocalypse I had attended in the year 2000 at the British Library. The images of that event have remained with me over the years and in finding the book, I was able to renew my knowledge and weave stories out of the result. I do actually have the book myself but it's in storage in Brisbane, Australia so marvelous to find it here! Research is one of the joys of writing a book and the London Library is a rich resource for it. I exit the Tube at Green Park and walk through some of the most expensive real estate in London. It's populated by royalty, the Ritz, art dealers and auctioneers like Sothebys, expensive boutique shops with armed guards, hidden member's clubs and embassies. 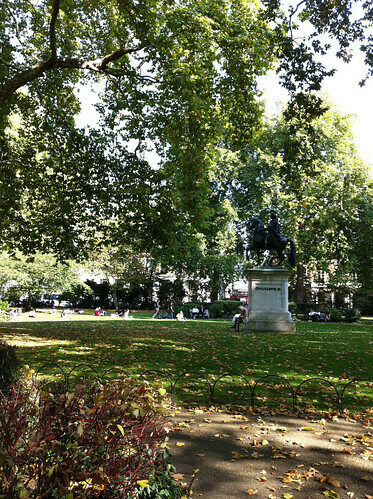 The library sits in one corner of the elegant St James' Square which boasts a beautiful park to sit for coffee and lunch in the sun. It isn't far from Bond Street, Regent Street and some lovely (window) shopping and my treat is to go to Waterstones bookshop for more browsing before I head home. The Library itself may look small but it's a tardis inside, stretching across multiple buildings behind the slim facade. London is steeped in tradition and history. You trip over famous (often dead) people everywhere you go. But it is still incredibly inspirational to think I am writing in a place where Agatha Christie was a member, where Virginia Woolf and EM Forster wrote, where Darwin and Dickens scribbled and where Tom Stoppard is currently president. This is a literary legacy of greatness. Is it too much to think that the walls have absorbed some of this creative spirit over the years and by being there, I too can imbibe? At my home office I have many distractions, blogging and twitter being two major ones. Yes, the London Library does have internet but I go there to write. I settle in and prepare myself for a day's work. 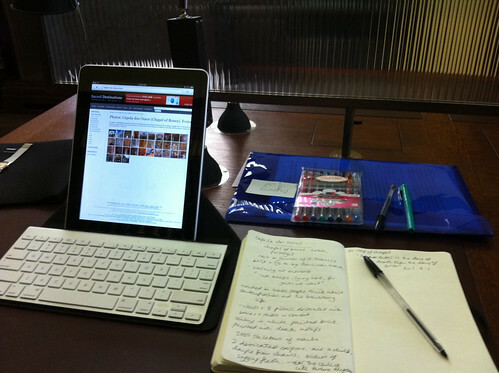 Soon I am surrounded by other industrious writers, on laptops, iPads or taking notes from books. There is a general atmosphere of hard creative work. Sometimes a member will nod off in one of the comfy reading chairs, a deserved break from the labour of intense study. This is how I worked at University when I spent my days in the Radcliffe Camera in Oxford. It feels like a correct place of work for a writer. 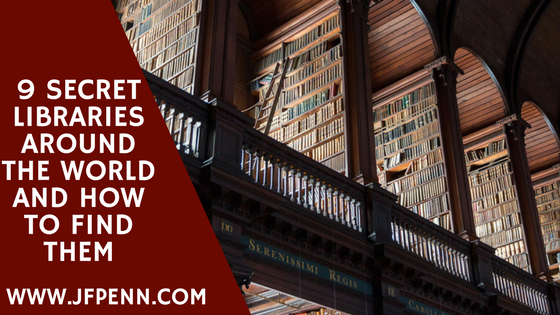 There is a room where laptops are forbidden so not even the tapping of keys distracts you, just the rustle of pages and the innumerably interesting journals on arcane topics that draw the eye. I have spent the last 13 years as an international business consultant with all the routine of an office worker. These daily rituals have become ingrained into me, the daily commute, coffee before starting, meeting for lunch in between spurts of intense working, perhaps a drink later in the day before coming home. Going from that life to working entirely from home as an author-entrepreneur hasn't been easy but going into a place of work like the London Library makes the writing life a more normal one and gives me a semblance of routine to base my creative life around. Getting out of the house and into a different space is critical for the solo-entrepreneur. Being in central London also gives me the benefits of being able to network at break-times and after the Library closes. I have only been a member for a few weeks and already the benefits of the London Library are immeasurable for me. I'm sure other advantages will be realized over time and I hope that I will also be able to give back. 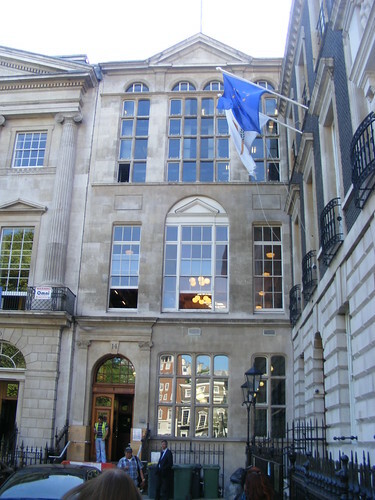 The London Library is a private, paid membership library. If you are interested in joining, all the details are here. The London Library from Jeremy Riggall on Vimeo.